The Los Angeles Community Action Network (LA CAN), a resident-led, community-based organization in Downtown and South Los Angeles, developed the Human Rights and Health Collective Project to address housing issues that impacted the health of low-income residents. In addition to teaching peer-to-peer educators how to navigate through regulatory or compliant housing processes, empower other residents to get involved, and engage landlords to change practices, the Human Rights and Health Collective also taught residents about the importance of fresh foods and how they could increase their access to fresh foods through community and rooftop gardens. Many of the peer-to-peer trainings focused on teaching residents about the importance of shifting the relationships between housing authorities or other landlords and low-income residents from an adversarial one to a cooperative one. "It took everyone working together to improve the conditions in my building, like no hot water and no heat," said Wesley Walker, another participant who became a peer educator. "In the process, we learned even more about how to improve our health." Lydia Trejo, a recent widow living in Downtown Los Angeles, was struggling to maintain her housing when she first started participating in this project. Through the Human Rights and Health Collective Project, she improved her access to fresh foods and her ability to address housing issues in her community." I learned so much in this program!" said Ms. Trejo, who went on to create her own rooftop garden and start a committee of residents who are dedicated to advocating for healthy housing conditions. In addition to peer-to-peer education, the Human Rights and Health Collective Project partnered with higher education institutions, community coalitions, and government agencies to conduct trainings and reach out to community members. "We thought it would be really difficult to engage large governmental agencies, but we were pleasantly surprised by how willing they were to support our project," said Becky Dennison, Project Director. "We learned that partnerships can always be formed. It’s just a matter of creating spaces for that dialogue to happen." The Human Rights and Health Collective Project reached an estimated 4,000 people, improving physical conditions of homes and reducing food insecurity and hunger. More specifically, this project addressed Healthy Homes and Healthy Communities within the Healthy People 2020 topic area of Environmental Health by reducing the proportion of occupied housing units that have moderate or severe physical problems and improving the housing situation of more than 600 units. In addition, the project addressed food insecurity within the Healthy People 2020 topic area of Nutrition and Weight Status. 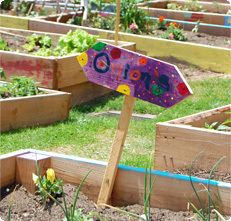 Through intensive health promotion and educational services, the project was able to increase participation in community gardens and the CalFresh Program, documenting reductions in food insecurity and hunger in over 400 households. According to Steve Diaz, a community organizer and peer educator, "This project is an example of what can happen when we all work together to improve community health. Though we worked a lot with individual households, we also worked with committees of people to get better outcomes. We didn’t just get one home improved. We got improvements that helped everyone."